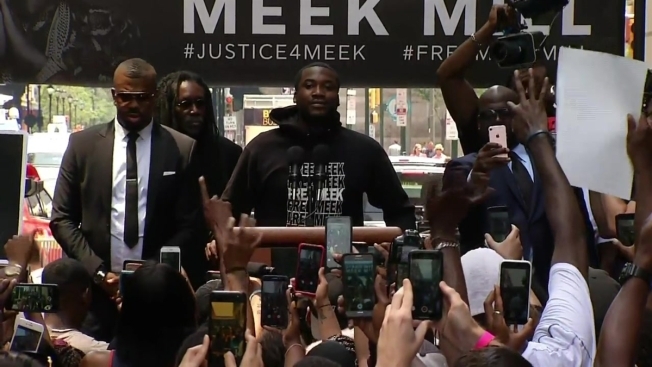 Rapper Meek Mill promised supporters gathered outside of a Philadelphia courthouse Monday that he will continue to use his platform to fight for criminal justice reform. Meek Mill's legal troubles are far from over. After a sometimes heated two-hour evidentiary hearing Monday afternoon, a Philadelphia judge said she needs more time to review information pertaining to a suspected tainted Philadelphia police officer who arrested Mill in 2007. "We knew justice would not be done today," Mill's lawyer, Joe Tacopina, said outside the courthouse. "This is far from over." Inside the courtroom, Judge Genece Brinkley appeared to cross-examine Bradley Bridge, a lawyer with the Defender Association who has overseen several thousand post-conviction petitions since 1995. Her line of questioning, which lasted almost an hour, drew outbursts from another of Mill's lawyers, Brian McMonagle, who accused Brinkley of "sabotaging" the proceedings. "You're being rude," Brinkley shot back on more than one occassion. The biggest question Monday revolved around a former Philadelphia police officer, Reginald Graham, whose sole testimony was central to Mill's conviction. He has since been found guilty by an internal affairs review of lying under oath and stealing money. But Brinkley remained unconvinced that Graham's questionable credibility was enough to grant post-conviction relief to the rapper. "We already know this is going to another court," Brinkley said in court. That comment also drew an outcry from the defense team. "Does that mean you already made a decision?" McMonagle asked, before adding that at least three convictions of other defendants based on Graham's testimony have been thrown out this year. The Philadelphia District Attorney's Office reiterated its approval of Mill's request for a new trial and said that granting his petition would not preclude further investigation into Graham. Earlier this month, the state Supreme Court split on a request by Mill to remove Brinkley from his case. On Monday, she pointed to the higher court's decision as reason enough to not recuse herself from the ongoing case. Meanwhile, outside of the courthouse, dozens of supporters gathered in support of Mill, whose legal name is Robert Williams. "Everybody that has some sense has said to drop it," Temple professor and celebrity academic Marc Lamont Hill said. "The system is not broken - the system is doing exactly what it was designed to do, which is put poor people in jail." Mill thanked supporters at a rally outside the courthouse before he stepped inside, noting his joy of spending Father's Day with his child.